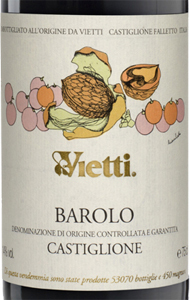 The Barolo 'Castiglione' by Vietti is one of the largest Italian Barolo. After bottling continues to improve in elegance and harmony for many years: it is an excellent wine to be forgotten in the cellar for at least three or four years. This barolo comes from 100% Nebbiolo grapes: Clone Michet 75%, 20% Lampia, Rosé 5%. 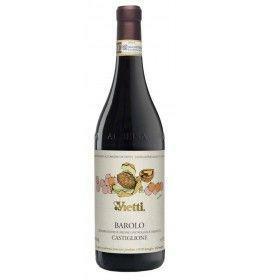 THE WINE The Barolo 'Castiglione' by Vietti is one of the largest Italian Barolo. After bottling continues to improve in elegance and harmony for many years: it is an excellent wine to be forgotten in the cellar for at least three or four years. This barolo comes from 100% Nebbiolo grapes: Clone Michet 75%, 20% Lampia, Rosé 5%. WINEMAKING The grapes are selected from the single vineyard Rocche in Castiglione Falletto, planted with roughly 4600 units per hectare. The vines were planted in three different moments, 1940, 1950 and 1968. The vineyard has a south-west exposure and a clay-limestone soil. Grapes are gently crushed and fermented for approximately 4 weeks in stainless steel tank with skin contact. This time includes pre- and post- fermentative maceration with the traditional method of submerged cap. Malolactic is done in oak. AGING The wine is aged for approximately 30 months in Slovenian oak casks. VINEYARDS 35 hectares of vineyards are produced, alongside the classic Dolcetto and Barbera "Trevigne" (wording which indicates that the wine is made from grapes from more than a single vineyard), Arneis and Moscato d'Asti Cascinetta , the "crus" Fortresses, Brunate, Lazzarito, Ravera and Villero Reserve in Barolo, Barbaresco Masseria, Scarrone and Vigna Vecchia in the Barbera d'Alba, and, since 1996, La Crena in Barbera d'Asti. Since 2000, with the withdrawal from the parents, Mario and Luca Cordero Conrad acquire the entire business ownership continuing the more productive activities with the greatest respect for tradition but with an open mind and evolutionary research of the highest quality and enjoyment of wine. A famous wine writer recently noted that Vietti "is always a family winery highly specialized in the production of different types of DOC and DOCG wines". ARTIST LABEL WINE Since 1974 certain Vietti wines have been dressed with specially-designed original works (lithographs, xylographies, etchings, silkscreens, linocuts) inspired by the wine of that particular vintage. The print run is the same as the number of bottles produced, and the first hundred labels are signed by the Artist. Each work is only used once, just for the wine of that vintage. Since the presentation of the 1982 Barolo Villero in 1988, the artist’s labels have been dedicated exclusively to the wines grown on this great vineyard. THE COMPANY The history of the Vietti winery traces its roots back to the 19th Century. Only at the beginning of the 20th century, however, did the Vietti name become a winery offering its own wines in bottle. Patriarch Mario Vietti, starting from 1919 made the first Vietti wines, selling most of the production in Italy. His most significant achievement was to transform the family farm, engaged in many fields, into a grape-growing and wine-producing business. Then, in 1952, Alfredo Currado (Luciana Vietti’s husband) continued to produce high quality wines from their own vineyards and purchased grapes. The Vietti winery grew to one of the top-level producers in Piemonte and was one of the first wineries to export its products to the USA market. Alfredo was one of the first to select and vinify grapes from single vineyards (such as Brunate, Rocche and Villero). This was a radical concept at the time, but today virtually every vintner making Barolo and Barbaresco wines offers “single vineyard” or “cru-designated” wines. Alfredo is also called the “father of Arneis” as in 1967 he invested a lot of time to rediscover and understand this nearly-lost variety. Today Arneis is the most famous white wine from Roero area, north of Barolo. Setting such a fine example with Arneis, even fellow vintners as far away those on the west coast of the United States now are cultivating and producing Arneis! Tasting Colore rosso rubino. Corpo pieno e complesso con aroma intenso di rose secche, liquirizia, spezie e tartufi. Elegante con tannini forti ma bilanciati. The grapes are selected from the single vineyard Rocche in Castiglione Falletto, planted with roughly 4600 units per hectare. The vines were planted in three different moments, 1940, 1950 and 1968. The vineyard has a south-west exposure and a clay-limestone soil. Grapes are gently crushed and fermented for approximately 4 weeks in stainless steel tank with skin contact. This time includes pre- and post- fermentative maceration with the traditional method of submerged cap. Malolactic is done in oak. The wine is aged for approximately 30 months in Slovenian oak casks. 35 hectares of vineyards are produced, alongside the classic Dolcetto and Barbera "Trevigne" (wording which indicates that the wine is made from grapes from more than a single vineyard), Arneis and Moscato d'Asti Cascinetta , the "crus" Fortresses, Brunate, Lazzarito, Ravera and Villero Reserve in Barolo, Barbaresco Masseria, Scarrone and Vigna Vecchia in the Barbera d'Alba, and, since 1996, La Crena in Barbera d'Asti. Since 2000, with the withdrawal from the parents, Mario and Luca Cordero Conrad acquire the entire business ownership continuing the more productive activities with the greatest respect for tradition but with an open mind and evolutionary research of the highest quality and enjoyment of wine. 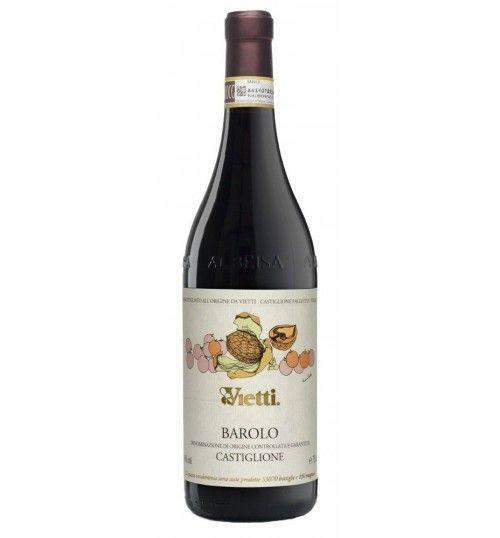 A famous wine writer recently noted that Vietti "is always a family winery highly specialized in the production of different types of DOC and DOCG wines".